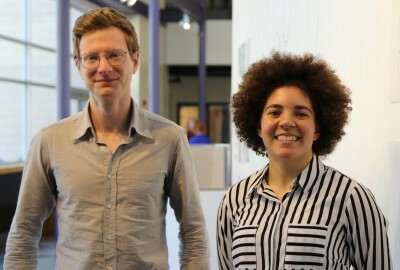 Park welcomed Emma Bratton ’10 and Sam Hulse ’08 to campus this morning as this year’s Millhauser Fellows. Started by Louise Eiseman Robinson Millhauser ’30 in 1998, and continued by her son, Allen Robinson, The Park School Graduate Student Fellows Program in Science, Mathematics, and Technology celebrates the careers of young alumni currently in graduate school in these fields. Each year, Millhauser Fellows are invited to Park to share their research with Upper School students in an assembly. While here, the fellows visit science and math classes and speak with students who are interested in pursuing careers in these fields. Emma is studying to become a veterinarian at The Ohio State University (OSU) College of Veterinary Medicine. She is a graduate of Brown University where she double majored in Philosophy and Biology with a focus in Ecology and Evolutionary Biology. Emma is passionate about animal welfare science and has created her own clinical rotation track at OSU around issues related to this topic. She has presented her research nationwide. Emma was selected to represent the state of Ohio at the American Veterinary Medical Association Legislative Fly-In, where she was able to lobby members of Congress. Sam is a Ph.D. student studying evolutionary biology and computational neuroscience at the University of Maryland Baltimore County (UMBC). He is a graduate of Juniata College where he earned a B.S. in Environmental Science. Sam is currently a Teaching Assistant for both Comparative Physiology Lab and Anatomy and Physiology Lab at UMBC. He is a recipient of the Chateaubriand Fellowship, given by the Embassy of France in the United States to foster research partnerships between the two countries. We are grateful to Louise Eiseman Robinson Millhauser ’30 and to her family for their continued support of the Millhauser Fellowship. Louise's curiosity about the sciences and her appreciation for the value of her own Park education led to her interest in supporting this important initiative. Click HERE to learn more about the program.